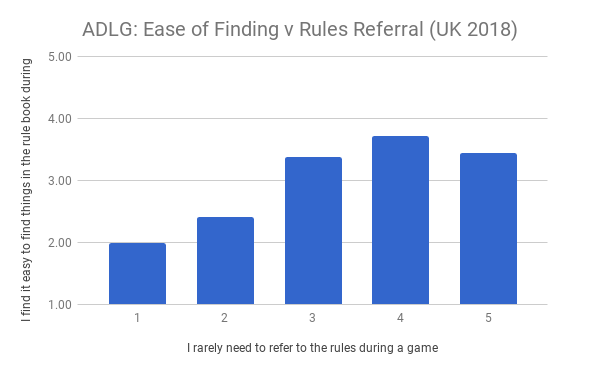 Views about the rule book and the use of the rules in games. This post aims to tidy up a few odds and ends. All the previous data was presented as simple averages and distributions. I made no attempt to link the answers to the various questions with one another. In this post I'd like to show you a couple of interesting correlations and discuss what they might mean. 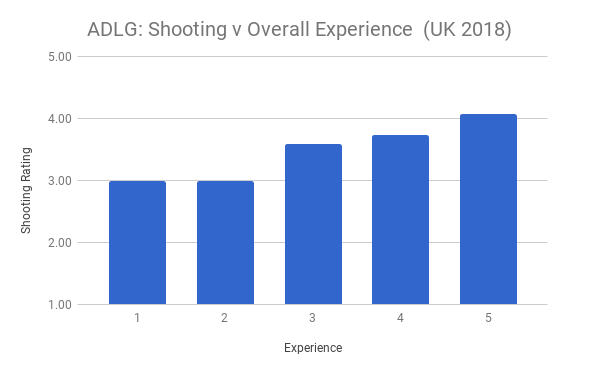 Imagine you are a novice ADLG player and you've only played a few games. You still use the rules book quite lot during your games. Does this mean that you suffer a "double whammy" because finding what you are looking for is also difficult? Well the answer is yes as this graph shows. There's a clear trend in the data. Basically, respondents who agreed they often used the rule book during a game (1-2) also tended not to find what they wanted very easily (1-2). On the other hand those who rarely used the rule book had roughly average difficulty finding what they want during a game. In a way this correlation is to be expected and is somewhat reassuring. Imagine trying to explain away the lack of a relationship like this. There are quite a few different possible explanations for this and I will look at two in the final section of this post. 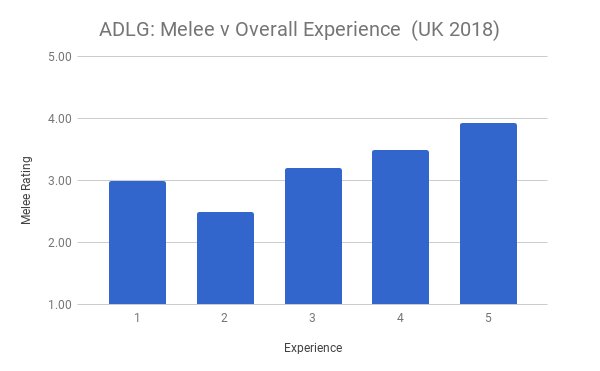 In Part 2 section 2.4, I reported that the shooting and melee sections were the lowest ranked sections of ADLG in terms of what's written and how easy they are to use. It's not good if two of the most frequently used sections of rules are rated the worst. 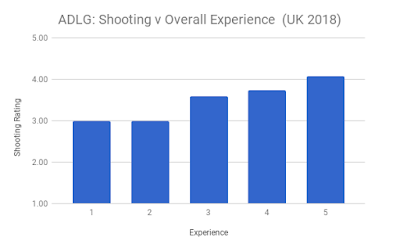 I began to wonder if the ratings of shooting & melee therefore influenced the way people rated their overall experience of ADLG. This is indeed the case. 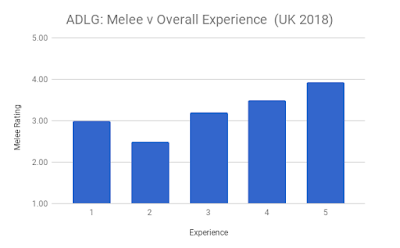 Again both data sets show a decent relationship indicating that the higher respondents rated either combat sections the higher they rated their experience with ADLG overall. The relationship isn't perfectly linear and the variation of the averages is quite large but the trend is clear. All this supports the suggestion I made previously that the combat sections (and processes) could benefit from some careful editing in any new version or play support documentation. The statisticians amongst you (there must be one!) will have noticed that I haven't quantified the correlations using any statistical tests. This is because this isn't work! Inexperienced players may struggle to find things in the rule book during a game simply because they haven't read the rules often enough, not because the book is badly written or organized. Alternatively, the book could be structured in such a way that certain people will always have to use it during games and therefore struggle to find what they want easily and dampening their enjoyment of ADLG. I don't have the data in this survey to separate these alternatives. You choose. Next I will compare the results of the 2018 ADLG survey with those of the 2009 DBMM survey. You have been warned.